As you probably heard, the Internet was in shock due to a vulnerability of some of the most popular underlying encryption software used by many popular web sites. We wanted to reassure you that Medivizor has checked its systems and verified that we were not compromised nor was any of our subscriber’s information. On April 7, 2014, a vulnerability named “Heartbleed” was disclosed to the public. This vulnerability affects several versions of a popular privacy and encryption library on the Internet (OpenSSL). This vulnerability could, potentially, allow attackers to compromise online systems and through that reveal personal information or credentials. 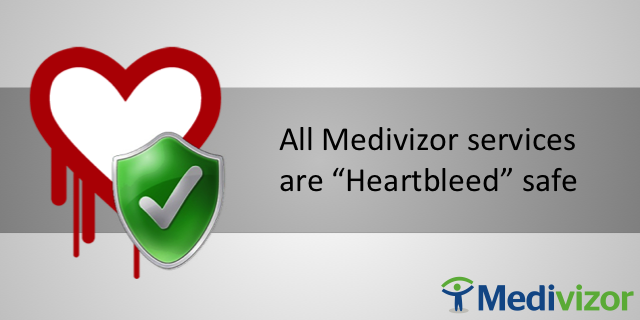 The good news is that Medivizor and its users were not susceptible. Our operations group verified that all Internet-exposed access as well as our back-end servers were never running the affected library versions. So, we just wanted to let you know you do not need to go and change your passwords on Medivizor. However, if you are using any of the popular services by Google, Yahoo, or Facebook – we’d encourage you to go ahead and change all those passwords… In fact, for a more comprehensive list of affected and unaffected sites, check here.